Cocoa, dark chocolate, nibs…there are so many different terms out there, how on earth is anyone really supposed to understand which chocolate is chocolate. To further add to the confusion, how are you supposed to tell what chocolate really is chocolate – after all, some products named “chocolate” are not chocolate at all. Chocolate, as we refer to it, is a product that goes through an extensive refining process that starts with the fruit of a tropical cacao tree. These cacao beans are fermented, dried, roasted and then ground to create cocoa butter – a smooth, rich solid fat that is used in not just food, but cosmetics and beauty products too. 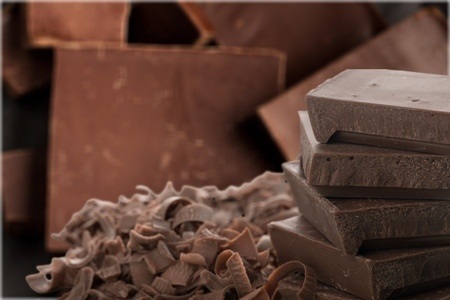 The type of chocolate you are eating (and if it’s really chocolate) depends on the amount of cocoa butter and chocolate liquor mixed in as well as the other non-chocolate ingredients, such as sugar. This is an unsweetened powder (though some varieties that are not meant for baking come with sweeteners). It is a defatted chocolate liquor. When you buy Dutch cocoa or Dutch processed you are buying an alkalized powder that has an intense chocolate flavor. More natural powders are light in color and have a very strong, pronounced chocolate flavor. It also has some acidity to it. Dutch-processed is darker and doesn’t have the same acid content – which is why it is recommended for recipes that use baking powder. Ever seen those bars of chocolate at the grocery store on the baking aisle? Nope, they aren’t for eating. These bitter chocolate bars are made from pure chocolate liquor, which is made from nothing but ground up cocoa beans. While it looks and smells like real chocolate, the bitter taste doesn’t make it great for eating solo. Instead, you will want to mix it up with some sugar and use it in your favorite recipes that call for unsweetened chocolate. The FDA considers something “chocolate” once it has 35 percent cocoa solids. Bittersweet chocolates have 50 percent or more chocolate liquor – there are some with as much as 80 percent. The result is a deeper, bitter flavor that is more pronounced than your average dark chocolate bar. Yes, they come in bars, bricks and even chocolate chip form – and it is one of the most widely used forms of chocolate thanks to the chocolate chip cookie. These contain 35 percent cocoa solids and are darker and sweeter than bittersweet chocolate, but because it’s not regulated, you may notice one brand’s “semi-sweet” doesn’t taste anything like another. It is dark chocolate, don’t let it fool you. But, it does not contain milk solids and it does have a high percentage of sugar – making it sweeter than regular dark chocolate. Most brands of sweet dark average 20 to 40 percent cocoa solids. This doesn’t just have cocoa butter and liquor – it also has condensed milk or dry milk solids. If you are eating European chocolates, you can bet there are condensed milk products in there. This variety is much sweeter than dark chocolate and lighter in color. It is much harder to temper and create chocolates with – because the sugar makes it prone to overheating. It’s technically got cocoa butter, but that is as close to “chocolate” as white chocolate comes. There are no other cocoa products or chocolate liquors in white chocolate; hence it’s classic white color. There is little to no chocolate taste and some brands add excessive amounts of sugar – which is why you may assume all white chocolate is too sweet. Typically vanilla beans or vanilla extracts are used to give it some flavor, but to be legally called white chocolate, it still needs 20 percent cocoa butter, 14 percent milk solids and 55 percent max of sugar. If you order up some gourmet confections, you are guaranteed to be eating couverture chocolates. This is used by professional bakers and confectioners because it has a high percentage of cocoa butter and chocolate liquor. It is rich, expensive and absolutely decadent. It is the preferred chocolate for tempering and dipping candies and can be purchased in dark, milk and white varieties. Eating chocolates from overseas? More specifically Europe? Then you are probably eating this chocolate that is made from cocoa and nut paste. Most countries in Europe use hazelnut paste, but it can also be made with almond paste. It is used to substitute flavors and can be rolled or cut. It could be called confectionery coating too. This is a candy product that is flavored like chocolate, but instead of cocoa butter it has oil. It is cheaper than chocolate because well, it isn’t chocolate. It is preferred for melting, dipping and making candies at home for the novice confectioner though. Now that you’ve seen just what there is to try out there, why not give a whirl? Chocolate of the Month Clubs are the perfect way to dive into just about every chocolate out there and see not only the varieties of chocolate, but how when paired with the right ingredients, you can taste something extraordinary.